"What is food to one man may be fierce poison to others" Lucretius. 95-55 B.C. This is my first attempt at a Daring Baker challenge. The Daring Bakers (and Daring Chefs) are a worldwide collective of foodbloggers who participate each month in a challenge, each making to the same recipe and then posting their experiences and photos of their results. I have followed the Daring Bakers for quite a while and often wished I was taking part, so now I have taken the plunge. On starting Daring Baker, I had been expecting to have to convert each recipe to gluten-free but amazingly, my first challenge is a gluten free recipe - this makes for a very easy life. Lauren who converted this recipe and hosted this challenge is a cool gluten free blogger from Canada, if you haven't come across her site and her recipes you are missing out, so do have a look at her blog here. 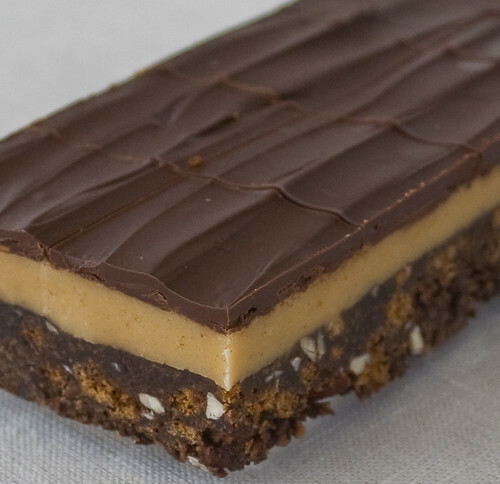 Nanaimo bars originate from a town called Nanaimo in Canada. These were chosen to remind us and celebrate next month's Winter Olympics which are being staged in Canada. I am really looking forward to the Winter olympics and am loving the BBC trail for them too. I will definitely make this recipe again to welcome the games into our house (a lame excuse, I know!). It may seem complicated or unnecessary to make these biscuits from scratch for the biscuit base, but it isn't. 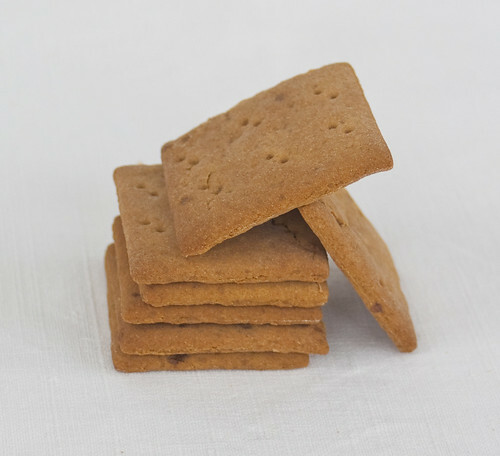 We don't have graham crackers in stores in the UK so it is often suggested to substitute with digestive biscuits, but don't, as there is little similarity. Instead grab your rolling pin and knock up a batch of these, you won't regret it! By the way, I have deviated from the traditional path a little to create a less sweet and, to my mind, more interesting filling. Hopefully I haven't insulted the folk of Nanaimo in doing this. If it is any consolation, the nut (any nut will do) filling tastes great! 65g buckwheat flour or potato starch (the original recipe called for Sorghum flour but it is v.difficult to find a completely gluten free source in the UK, so I have substituted this). Chop the butter into a very fine dice then freeze for 30 minutes. If using dairy free margarine, freeze 100g then chop or grate once frozen. Sieve flours and bicarbonate of soda together. In a small bowl, whisk together the honey, milk and vanilla. Blend again until the mix is the consistency of a coarse meal (no chunks of butter should be visible). Add the liquid blend to the flour mixture and mix again until the dough barely comes together. It will be very soft and sticky. Turn the dough onto a surface well-floured with sweet rice flour and pat the dough into a rectangle about 1 inch thick. Cut in half, bag each piece and chill until firm, about 2 hours, or overnight. Sift an even layer of sweet rice flour onto the work surface and roll 1 piece of the dough into a long rectangle, about 1/8 inch thick. The dough will be quite sticky, so flour as necessary. Cut into 2 inch squares, prick with a fork over each biscuit, set on a baking tray. If the dough is sticky, chill the trays for half an hour before baking (I baked these on the snowiest weekend in early January so didn't need to do this). Gather the scraps together and set aside. Repeat with the second batch of dough. Gather the scraps together into a ball, chill until firm, and reroll. Dust the surface with more sweet rice flour and roll out the dough to get a couple more wafers. Bake for 15 minutes, until browned and slightly firm to the touch, rotating sheets halfway through to ensure even baking. This might take a little longer, but not much, The biscuits will come out soft but crispen on cooling. If they don't get fully crisp pop them back in the oven for another 5 minutes. When cooled completely, place 160g biscuits in a food processor and pulse to make crumbs. Another way to do this is to place in a large ziplock bag, force all air out and smash with a rolling pin until wafers are crumbs. Stir in the crumb, coconut and nuts then pour into the prepared tin. Press in to create a firm even base, chill until the middle layer is ready. soften butter and peanut butter in a microwave until soft. These bars freeze very well, so don’t be afraid to pop some into the freezer. The graham wafers may be kept in an airtight container for up to 2 weeks (mine lasted about that long). If making the graham crackers with wheat, replace the gluten-free flours (tapioca starch, sweet rice flour, and sorghum flour) with 2 ½ cups plus 2 tbsp of all-purpose wheat flour, or wheat pastry flour. your crackers alone look delicious and the bars are so pretty and divine looking. amazing work with this challenge. the bars look so lovely..great work. pretty pretty pictures! 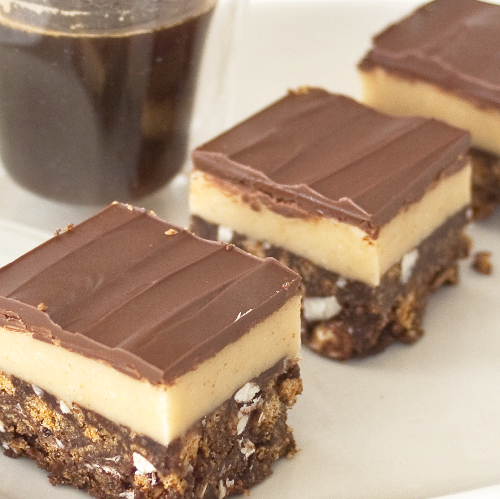 your nanaimo bars look so perfect! Wow your crackers look great. Looks neat, beautiful and delicious. Well done! They look fantastic, and I don't think anyone here will be offended by your changing of the filling! I am Canadian and find them too sweet too, so I made a more custardy layer than the original. Beautiful photos! Well done on the challenge! 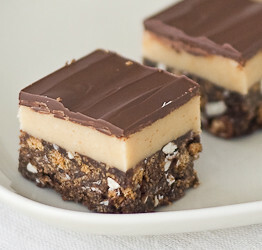 Your bars look so neat and well made, and I love the idea of adding peanut butter. I'm so glad I could be the one to welcome you into the Daring Bakers =D. Isn't it nice not to have to adapt? Your wafers and bars look sensational! Also, making them for the Olympics is most definitely not a lame excuse! I think I'll be doing the same =D. One among the neatest bars I 've seen around. The nut middle layer sounds great and as you say probably a better level of sweetness for us Brits. I did like the original version but more than about a 1" square started to make me feel I'd go into sugar shock.. much like Kendle Mintcake ! Glad to find your blog too! Perfect treat for my little brother - he needs a high power snack when he's out on a cold moor on a game shoot and this fits the bill! ooh that looks lovely. Curling is big where I live in Scotland, two of the Team GB going to Canada come from our town. Congrats on completing your first challenge and your bars look so even!! Great job! I really enjoyed making these bars as well as the challenge of making a recipe which I would probably overlook otherwise. Having never heard of Nanaimo in Canada before this challenge, I have know discovered several connections with the town from within my own family ... not least, though quite the most random being that the cat of my cousin's neighbours in the west of France comes from Nanaimo, now that is one well-travelled cat!